STORY: Forest officials in India’s northern Prayagraj city on Wednesday (November 07) rescued a Pangolin and arrested five smugglers. Reportedly, police had been trying to nab active smugglers in the area and the arrests were made after they received information about their presence. 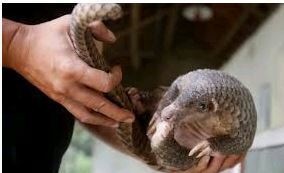 The accused were planning to smuggle the endangered species of Pangolin out of the country. An investigation into the matter is underway. The Pangolin, a small, armadillo-like mammal, has large keratin scales covering their skin which is known for its aphrodisiac and medicinal values.